"Code of Canon Law" and "Codex Iuris Canonici" redirect here. For the code governing the Eastern Catholic Churches, see Code of Canons of the Eastern Churches. For the Latin code in effect prior to 1983, see 1917 Code of Canon Law. For the history of canonical codification, see Canon law (Catholic Church) and Legal history of the Catholic Church. The 1983 Code of Canon Law (abbreviated 1983 CIC from its Latin title Codex Iuris Canonici), also called the Johanno-Pauline Code, is the "fundamental body of ecclesiastical laws for the Latin Church". It is the second and current comprehensive codification of canonical legislation for the Latin Church sui iuris of the Catholic Church. It was promulgated on 25 January 1983 by John Paul II and took legal effect on the First Sunday of Advent (27 November) 1983. It replaced the 1917 Code of Canon Law, promulgated by Benedict XV on 27 May 1917. The current Code of Canon Law is the second comprehensive codification of the non-liturgical laws of the Latin Church, replacing the Pio-Benedictine code that had been promulgated by Benedict XV in 1917. See also Canon Law-Codification and Code of Canons of the Eastern Churches. Pope John XXIII, when proclaiming a new ecumenical council for the Catholic Church, also announced the intention of revising the 1917 CIC. It was not feasible to revise the Code of Canon Law until after the conclusion of the Second Vatican Council, so that the decisions of the Council could guide the revision of ecclesiastical laws. Several of the council documents gave specific instructions regarding changes to the organization of the Catholic Church, in particular the decrees Christus Dominus, Presbyterorum Ordinis, Perfectae Caritatis, and Ad gentes. In 1966, Pope Paul VI issued norms to apply these instructions through the motu proprio Ecclesiae Sanctae. The Pontificia Commissio Codici iuris canonici recognoscendo, which had been established in 1963, continued the work of revising the Code of Canon Law through the pontificate of Paul VI, completing the work in the first years of the pontificate of John Paul II. On 25 January 1983, with the Apostolic Constitution Sacrae disciplinae leges John Paul II promulgated the current Code of Canon Law for all members of the Catholic Church who belonged to the Latin Church. It entered into force the first Sunday of the following Advent, which was 27 November 1983. In an address given on November 21, 1983 to the participants in a course at the Gregorian University in Rome on the new Code of Canon Law, the Pope described the new Code as "the last document of Vatican II". This apostolic constitution instituted the 1983 Code of Canon Law for the Latin Church. John Paul II later promulgated a code of canon law for the 22 sui juris Eastern Catholic Churches—the Code of Canons of the Eastern Churches—by means of the Apostolic Constitution Sacri Canones of 18 October 1990. While there have been many vernacular translations of the Code, only the original Latin text has the force of law. The instrument, which the Code is, fully corresponds to the nature of the Church, especially as it is proposed by the teaching of the Second Vatican Council in general, and in a particular way by its ecclesiological teaching. Indeed, in a certain sense, this new Code could be understood as a great effort to translate this same doctrine, that is, the conciliar ecclesiology, into canonical language. If, however, it is impossible to translate perfectly into canonical language the conciliar image of the Church, nevertheless, in this image there should always be found as far as possible its essential point of reference. Thus the 1983 Code is configured, as far as possible, according to the "mystery of the Church", the most significant books – Two, Three and Four – corresponding to the munus regendi, the munus sanctificandi, and the munus docendi (the "missions" of governance, of worship/sanctification, and of teaching) which in turn derive from the kingly, the priestly and the prophetic roles or functions of Christ. The 1983 Code of Canon Law contains 1752 canons, or laws, most subdivided into paragraphs (indicated by "§") and/or numbers (indicated by "°"). Hence a citation of the Code would be written as Can. (or Canon) 934, §2, 1°. Article II. The Chancellor, other Notaries and the Archives." Some canons contain "numbers" without "paragraphs", while most canons contain "paragraphs", and most "paragraphs" do not contain "numbers". This is the outline of the seven books of the 1983 Code of Canon Law. Legal sources are laws (including custom as a special way of legislation because of the need of the approval of the legislator), which contain universal regulations, general decrees, instructions and statutes which refer to a special group, and in case of statutes are legislated by this group itself, and administrative acts, which only decide single cases. Persons are physical persons or juridical persons. In contrast with traditional secular legislation, not everybody is a physical person according to the Corpus Juris Canonici, because one is constituted a person with duties and rights only by christening. The Codex specifies conditions for the validity of a juridical act, especially in relation to form, coercion, misapprehension and lack of participation. Legal power is divided into the three authorities of legislative, executive and judiciary. The ability to conduct juridical acts can be attached to an office or it can be delegated to a person. Appointment and loss of ecclesiastical office are regulated. Time regulates prescription, which goes along with the national regulations, but can only be achieved in good faith, and definitions of time. Book two describes the "People of God". It discusses the general rights and obligations of members of the church, and then discusses the ordering of the church, from the Holy See to the local parish. Institutions of consecrated life and societies of apostolic life. The Christian faithful shows the obligations of the faithful in common, those of the lay and those of the sacred ministers or clerics with special consideration of the formation and enrolment of clerics and personal prelatures. Furthermore, the associations of the Christian faithful especially their recognition as a juridic person are constituted, divided in public, private associations and those of the lay. Part II is entitled, "The Hierarchical Constitution of the Church". This part describes the composition, rights and obligations of the Supreme Authority of the Church, consisting of the Roman Pontiff, the College of Bishops, the Synod of Bishops, the College of Cardinals, the Roman Curia and the Papal legates. A secular institute is an institute of consecrated life in which the Christian faithful, living in the world, strive for the perfection of charity and seek to contribute to the sanctification of the world, especially from within. Societies of apostolic life do not use a vow. Book III describes the teaching function of the church. 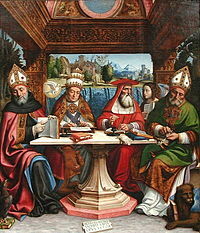 The forms of teaching are the ministry of the Divine Word in the forms of the preaching of the word of God and the catechetical instruction, the missionary action of the church, the Catholic education in schools, Catholic universities and other institutes of higher studies and the ecclesiastical universities and faculties, the instruments of communication and books in particular and finally the profession of faith. The sacraments are baptism, confirmation, the most holy Eucharist, penance, anointing of the sick, holy orders and marriage. These sacraments are described with conditions, ceremony and participants. Other acts of divine worship are sacramentals, the liturgy of the hours, ecclesiastical funerals, the veneration of the saints, sacred images and relics and the vow and oath. Sacred places are those which are dedicated for divine worship or for the burial of the faithful. The Code knows five kinds of sacred places: churches, oratories and private chapels, shrines, altars and cemeteries. Sacred times are feast days and days of penance. This part of the Corpus Juris is the regulation of the civil law. There are instructions concerning the acquisition and administration of goods especially the acquisition by bestowal either through an act inter vivos or through an act mortis causa and contracts with special care of alimentation. The second part shows individual delicts, divided into delicts against religion and unity of the church, those against ecclesiastical authorities and the freedom of the church, those against special obligations, those against human life and freedom, usurpation of ecclesiastical functions and delicts in their exercise, and the crime of falsehood. In addition to these cases (and those stated in other laws) the external violation of a divine or canonical law can be punished when the special gravity of the violation demands punishment and there is an urgent need to prevent or repair scandals. Book VII contains the legal procedure. It is divided in 5 parts. The first part trials in general defines the court system, its two local instances and the Roman Pontiff as the supreme judge with the representation by the tribunals of the Apostolic See, especially the Roman Rota. It determines the participants of the lawsuit, the judge, the auditors and relators, the promoter of justice, the Defender of the Bond, the notary, the petitioner, the respondent, and the procurators for litigation and advocates. Finally it describes the discipline to be observed in tribunals, with the duty of judges and ministers, the order of adjudication, the time limits and delays, the place of the trial, the persons to be admitted to the court, the manner of preparing and keeping the acts, and the actions and exceptions in general and specific. The contentious trial begins with the introductory libellus of litigation and the citation and notification of juridical act. The joinder of the issue occurs when the terms of the controversy are defined by the judge, through a decree of the judge. Further on, this part explains the trial of the litigation, especially the absence of a party, the intervention of a third person and the proofs. There are six kinds of proof: declarations of the parties, documents, testimonies, experts, judicial examination and inspection, and presumptions. After taking evidence the acts are published, the case concluded and then discussed. The case ends with the sentence of the judge. The sentence can be challenged by complaint of nullity and by appeal. Finally the res inducta and restitutio in integrum, the execution of the judgement, the judicial expenses and gratuitous legal assistance are regulated. As an alternative to this contentious trial there is the possibility of an oral contentious process. Part three defines special processes and their special regulations, the process for declaring the nullity of marriage, cases of separation of spouses, process for the dispensation from a marriage ratum sed non consummatum, the process in the presumed death of spouses, and cases for declaring the nullity of sacred ordination. This part also shows methods of avoiding trials. Part four shows the proceedings of the penal process, with the preliminary investigation, the trial, and the adhesive procedure. The last part shows the methods of proceeding in administrative recourse, which can be made by any person who claims to have been aggrieved by a decree, and the removal or transfer of pastors with display of the reasons for the removal or transfer. After the promulgation of the 1983 Code of Canon Law, popes have amended it five times, with changes to 39 canons in total (111, 112, 535, 750, 838, 868, 1008, 1009, 1086, 1108, 1109, 1111, 1112, 1116, 1117, 1124, 1127, 1371, and 1671–1691). On 18 May 1998 Pope John Paul II issued the motu proprio Ad tuendam fidem, which amended two canons (750 and 1371) of the 1983 Code of Canon Law and also two canons (598 and 1436) of the 1990 Code of Canons of the Eastern Churches, so as to add "new norms which expressly impose the obligation of upholding truths proposed in a definitive way by the Magisterium of the Church, and which also establish related canonical sanctions." On 26 October 2009 Pope Benedict XVI issued the motu proprio Omnium in Mentem, which amended five canons (1008, 1009, 1086, 1117, 1124) of the 1983 Code of Canon Law clarifying that, among those in Holy Orders, only bishops and priests received the power and mission to act in the person of Christ the Head while deacons obtained the faculty to exercise the diakonias of service, Word, and charity. The amendments also removed formal defection from the Catholic faith as excusing Catholics from the canonical form of marriage. On 15 August 2015 Pope Francis issued the motu proprio Mitis Iudex Dominus Iesus, which amended twenty-one canons (1671–1691) to reform the process of determining matrimonial nullity. The document was made public on 8 September 2015. On 3 September 2017 Pope Francis issued the motu proprio Magnum principium, which amended one canon (838) to grant episcopal conferences authority over liturgical translations. On 19 March 2019, Pope Francis issued an apostolic letter given motu proprio Communis vita. It institutes ipso facto dismissal of religious who are absent for a full year illegitimately from their religious house. It replaces canons 694 and 729 in their entirety, with a vacatio legis of 10 April 2019. Canon 97 reduces the canonical age of majority from 21 to 18, according to the consensus of civil law. Canons 823 to 824 decree that bishops are obligated to censor material concerning faith or morals. The implementation of Canon 915 is quite controversial. See the article Canon 915 for more information. Canon 916 decrees clergy in mortal sin are not allowed to celebrate Mass, and laypeople in mortal sin are not allowed to receive the Eucharist, except when they have a grave reason and there is no opportunity to confess, in which case they must make an Act of Perfect Contrition and confess their mortal sins as soon as possible. Canon 919 §1 decrees a one-hour fast before the reception of the Eucharist (this fast does not include water or medicine). ^ Edward N. Peters, Master Page on the Johanno-Pauline Code of 1983, CanonLaw.info, accessed 14 April 2016. ^ John Paul II, ap. const. Sacrae Disciplinae Leges, accessed 28 March 2016. ^ "CATHOLIC ENCYCLOPEDIA: Canon Law". www.newadvent.org. Retrieved 3 April 2018. ^ "Ai partecipanti al corso sul nuovo Codice di Diritto Canonico (21 novembre 1983) | Giovanni Paolo II, n. 2". w2.vatican.va. Retrieved 2018-08-26. ^ "CCEO – Table of Contents – IntraText CT". www.intratext.com. Retrieved 3 April 2018. ^ Confer "CANON LAW AND COMMUNIO Writings on the Constitutional Law of the Church", 1, 1, at  Archived 2014-03-26 at the Wayback Machine. ^ "Leaving the Catholic Church no Longer Possible". ^ Pope Francis: New rules for religious life, VaticanNews.va, accessed 26 March 2019.